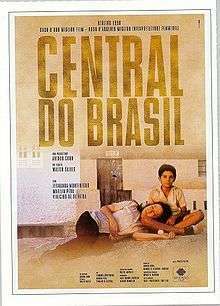 Central Station (Portuguese: Central do Brasil) is a 1998 Brazilian–French drama film set in Brazil. It tells the story of a young boy's friendship with a jaded middle-aged woman. The film was adapted by João Emanuel Carneiro and Marcos Bernstein from a story by Walter Salles, who directed it. It features Fernanda Montenegro and Vinícius de Oliveira in the major roles. 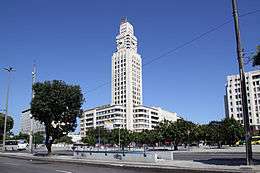 The film's title in Portuguese is the name of Rio de Janeiro's main railway station. Montenegro's performance earned her critical acclaim and an Academy Award for Best Actress nomination. The film itself was nominated for the Academy Award for Best Foreign Language Film. Estação Central do Brasil, the most famous and important railway station in Brazil. Also served as the setting and title of the famous film. Dora is a retired schoolteacher who has become embittered. She works at Rio de Janeiro's Central Station, writing letters for illiterate customers, in order to make ends meet. She can be impatient with her customers and sometimes does not mail the letters that she writes, putting them in a drawer or even tearing them up. Josué is a poor 9-year-old boy who has never met his father, but hopes to do so. His mother sends letters to his father through Dora, saying that she hopes to reunite with him soon, but when she is killed in a bus accident just outside the train station, the boy is left homeless. Dora takes him in and traffics him to a corrupt couple, but she is made to feel guilty by her neighbor and friend Irene and later steals him back. Dora is initially reluctant to be responsible for the boy, but ends up deciding to take a trip with him to Northeast Brazil in order to find his father's house and leave him there. Dora tries to leave Josué on the bus, but he follows her, forgetting his backpack containing Dora's money. Penniless, they are picked up by a kind, Evangelical truck driver who abandons them when Dora encourages him to drink beer and then grows too friendly. Dora trades her watch for a ride to Bom Jesus do Norte. They find his father's address in Bom Jesus, but the current residents say that Jesus won a house in the lottery, and now lives in the new settlements, adding that he lost the house and money through drinking. With no money, Josué saves them from destitution by suggesting Dora write letters for the pilgrims who have arrived in Bom Jesus for a massive pilgrimage. This time she posts the letters. They take the bus to the settlements, but when they locate the address they have for Josué's father, they are told by the new residents that he no longer lives there and has disappeared. Josué tells Dora that he will wait for him, but Dora invites him to live with her. She calls Irene in Rio and asks her to sell her refrigerator, sofa and television. She says that she will call when she gets settled somewhere. After she hangs up, she learns that there are no buses leaving until the next morning. Isaías, one of Josué's half-brothers, is working on a roof next to the bus stop, and learns that they are looking for his father. After introducing himself, Dora says that she is a friend of his father and was in the area. Isaías insists that she and Josué, who, suspicious of the stranger, has introduced himself as Geraldo, come to dinner. They return to his house, where they meet Moisés, the other half-brother. Later, Isaías explains to Dora that their father married Ana, who he doesn't know is Josué's mother, after their mother died, and that nine years ago, while pregnant, Ana left her drunken lover for Rio and never returned. Isaías asks Dora to read a letter that his father wrote to Ana when he disappeared, six months ago, in case she returned. In the letter, the boys' father explains that he has gone to Rio to find Ana and the son he has never met. He promises to return, asks her to wait for him, and says they can all be together—himself, Ana, Isaías and Moisés. At this point Dora pauses, looks at Josué and says, "and Josué, whom I can't wait to meet." Isaías and Josué both say that he will return, but Moisés doesn't think so. The next morning, while the sons sleep, Dora sneaks out to catch the bus for Rio. She first leaves beside the letter from Jesus the one from Ana to Jesus, the one Dora carried with her from the Central Station but never mailed, expressing Ana's wish for the family to be reunited. Josué wakes up too late to prevent her departure. Dora writes a letter to Josué on the bus. Both are left with the photos they had taken by which to remember one another. Being a co-production between Brazil and France, the film was chosen by the French Ministry of Culture to receive resources of Fonds Sud Cinema, for their funding. Central Station, was first shown in a regional film festival in Switzerland on January 16, 1998, on January 19 was shown at the Sundance Film Festival in the United States. On February 14, 1998, was shown at the Berlin Film Festival, launched in Brazil occurred only on the 3rd of April of the same year. The film is ranked No. 57 in Empire magazine's "The 100 Best Films of World Cinema" in 2010. ↑ "A comercialização de um filme internacional: Central do Brasil". asaeca.org/. ↑ "The 71st Academy Awards (1999) Nominees and Winners". oscars.org. Retrieved 20 October 2015. ↑ "Cinemateca Nacional: Central do Brasil (1998)". Cinemateca Brasileira. ↑ Maslin, Janet (20 November 1998). "A Journey of Hope and Self-Discovery for Two Hard-Bitten Souls". The New York Times. Retrieved 2011-09-23. ↑ Schickel, Richard (14 December 1998). "Central Station". Time. Retrieved 2011-09-23. ↑ Gleiberman, Owen (27 November 1998). "Central Station". Entertainment Weekly. Retrieved 2011-09-23. ↑ "The 100 Best Films of World Cinema | 57. Central Station". Empire.